Almond Butterfly is a 100% gluten free cafe & bakeshop, with vegan and paleo options. 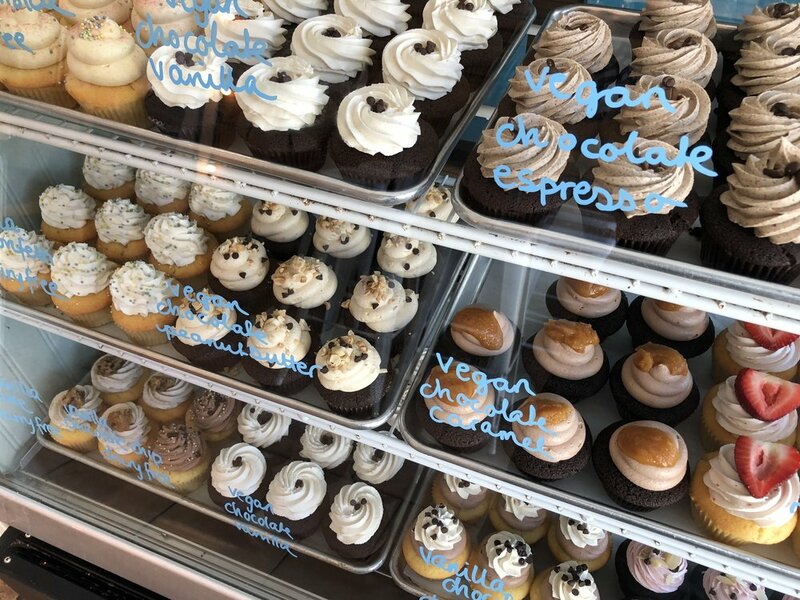 We're proud to offer a full menu of homemade gluten free cupcakes & fresh baked goods (all made on-site, from our own recipes), as well as toasted breakfast sandwiches, lunch melts, savory pizza bagels, and handcrafted espresso beverages. Since 2011, our mission at Almond Butterfly has been to create delicious food which tastes sooooo good that you, your friends, and family won't even think about the fact that it's gluten free. In fact, we think gluten free can taste even better... when done right. Gluten free / dairy free cupcake, vanilla base, lemon vanilla frosting, organic sprinkles *contains eggs. Gluten free / vegan cupcake, chocolate base, chocolate frosting, homemade vegan caramel sauce topping. Gluten free / vegan cupcake, chocolate base, vanilla frosting, chocolate chip cookie dough topping. Gluten free / vegan cupcake, chocolate base, vanilla espresso frosting, fresh espresso bean garnish. Gluten free / dairy free cupcake, vanilla base, strawberry vanilla frosting, fresh strawberry garnish. *contains eggs. Gluten free / vegan cupcake, chocolate base, homemade peanut butter frosting, homemade mini vegan peanut butter cookie garnish. Gluten free / vegan cupcake, chocolate base, chocolate frosting, vegan chocolate chip and organic sprinkle garnish. Gluten free / dairy free, carrot cupcake, coconut, carrot, allspice, orange, vanilla frosting, chopped toasted pecan garnish. Gluten free / dairy free cupcake, vanilla base, vanilla frosting, organic sprinkles *contains eggs. Gluten free / dairy free cupcake, vanilla base with poppyseeds, lemon vanilla frosting, *contains eggs. Gluten free / dairy free cupcake, vanilla base, pink almond vanilla frosting, almond sliver garnish. *contains eggs. SAVE 13% (NO TAX) + AN ADDITIONAL 10% WHEN YOU PRE-ORDER ONLINE! SAVE 13% TAX + AN ADDITIONAL 10% when you PRE-order online! Egg / aged white cheddar / spinach / tomato / pesto / toasted gluten free buttered bagel Available dairy free. By SOCIAL COFFEE & TEA CO.
SAVE AN ADDITIONAL 10% ON CUPCAKES & BAKED GOODS! Due to volume, we are no longer accepting pre-orders by phone. Please place your pre-order online. Thanks.